Epictetus (pronounced Epic-TEE-tus) was an exponent of Stoicism who flourished in the early second century C.E. about four hundred years after the Stoic school of Zeno of Citium was established in Athens. He lived and worked, first as a student in Rome, and then as a teacher with his own school in Nicopolis in Greece. Our knowledge of his philosophy and his method as a teacher comes to us via two works composed by his student Arrian, the Discourses and the Handbook. Although Epictetus based his teaching on the works of the early Stoics (none of which survives) which dealt with the three branches of Stoic thought, logic, physics and ethics, the Discourses and the Handbook concentrate almost exclusively on ethics. The role of the Stoic teacher was to encourage his students to live the philosophic life, whose end was eudaimonia ('happiness' or 'flourishing'), to be secured by living the life of reason, which – for Stoics – meant living virtuously and living 'according to nature'. The eudaimonia ('happiness') of those who attain this ideal consists of ataraxia (imperturbability), apatheia (freedom from passion), eupatheiai ('good feelings'), and an awareness of, and capacity to attain, what counts as living as a rational being should. The key to transforming oneself into the Stoic sophos (wise person) is to learn what is 'in one's power', and this is 'the correct use of impressions' (phantasiai), which in outline involves not judging as good or bad anything that appears to one. For the only thing that is good is acting virtuously (that is, motivated by virtue), and the only thing that is bad is the opposite, acting viciously (that is, motivated by vice). Someone who seeks to make progress as a Stoic (a prokoptôn) understands that their power of rationality is a fragment of God whose material body – a sort of rarefied fiery air – blends with the whole of creation, intelligently forming and directing undifferentiated matter to make the world as we experience it. The task of the prokoptôn, therefore, is to 'live according to nature', which means (a) pursuing a course through life intelligently responding to one's own needs and duties as a sociable human being, but also (b) wholly accepting one's fate and the fate of the world as coming directly from the divine intelligence which makes the world the best that is possible. It is possible to draw only a basic sketch of Epictetus' life. Resources at our disposal include just a handful of references in the ancient texts, to which we can add the few allusions that Epictetus makes to his own life in the Discourses. Epictetus was born in about 55 C.E. in Hierapolis in Phrygia (modern-day Pamukkale, in south-western Turkey). As a boy he somehow came to Rome as a slave of Epaphroditus who was a rich and powerful freedman, having himself been a slave of the Emperor Nero (he had been an administrative secretary). Whilst still a slave, Epictetus studied with the Stoic teacher Musonius Rufus. There is a story told by the author Celsus (probably a younger contemporary of Epictetus) – quoted by the early Christian Origen (c.185–254) at Contra Celsum 7.53 – that when still a slave, Epictetus was tortured by his master who twisted his leg. Enduring the pain with complete composure, Epictetus warned Epaphroditus that his leg would break, and when it did break, he said, 'There, did I not tell you that it would break?' And from that time Epictetus was lame. The Suda (tenth century), however, although confirming that Epictetus was lame, attributes his affliction to rheumatism. At some point Epictetus was manumitted, and in about 89, along with other philosophers then in Rome, was banished by the Emperor Domitian. He went to Nicopolis in Epirus (in north-western Greece) where he opened his own school which acquired a good reputation, attracting many upper-class Romans. One such student was Flavius Arrian (c.86–160) who would compose the Discourses and the Handbook, and who later served in public office under the Emperor Hadrian and made his mark as a respected historian (much of his writings survive). Origen (Contra Celsum 6.2) reports that Epictetus had been more popular in his day than had Plato in his. Aulus Gellius (c.125–c.165) reports that one of Marcus Aurelius' teachers, Herodes Atticus (c.101–177), considered Epictetus to be 'the greatest of Stoics' (Attic Nights 1.2.6). Our sources report that Epictetus did not marry, had no children, and lived to an old age. With respect to marriage and children we may note the story from Lucian (Demonax 55) about the Cynic philosopher Demonax who had been a pupil of Epictetus. On hearing Epictetus exhort his students to marry and have children (for it was a philosopher's duty to provide a substitute ready for the time when they would die), he sarcastically asked Epictetus whether he could marry one of his daughters. It appears that Epictetus wrote nothing himself. The works we have that present his philosophy were written by his student, Flavius Arrian. We may conjecture that the Discourses and the Handbook were written some time around the years 104–107, at the time when Arrian (born c.86) was most likely to have been a student. Dobbin (1998), though, holds the view that the Discourses and the Handbook were actually written by Epictetus himself; the Suda does say, after all, that Epictetus 'wrote a great deal'. Dobbin is not entirely convinced by Arrian's claim in his dedicatory preface that he wrote down Epictetus' words verbatim; firstly, stenographic techniques at this time were primitive, and anyway were the preserve of civil servants; secondly, most of the discourses are too polished, and look too much like carefully crafted prose to be the product of impromptu discussions; and thirdly, some of the discourses (notably 1.29, 3.22 and 4.1) are too long for extempore conversations. There is no way to resolve this question with certainty. Whether the texts we have do indeed represent a serious attempt to record Epictetus at work verbatim, whether draft texts were later edited and rewritten (as seems wholly likely), possibly by Epictetus, or whether Epictetus did in fact write the texts himself, drawing on his recollections as a lecturer with only occasional attempts at strictly verbatim accuracy, we shall never know. But what we can be certain of, regardless of who actually wrote the words onto the papyrus to make the first draft of the text as we have it today, is that those words were intended to present Stoic moral philosophy in the terms and the style that Epictetus employed as a teacher intent on bringing his students to philosophic enlightenment as the Stoics had understood this enterprise. Written in Koine Greek, the everyday contemporary form of the language, Epictetus' Discourses appear to record the exchanges between Epictetus and his students after formal teaching had concluded for the day. Internal textual evidence confirms that the works of the early Stoic philosophers (Zeno, Cleanthes and Chrysippus) were read and discussed in Epictetus' classes, but this aspect of Epictetus' teaching is not recorded by Arrian. What we have, then, are intimate, though earnest, discussions in which Epictetus aims to make his students consider carefully what the philosophic life – for a Stoic – consists in, and how to live it oneself. He discusses a wide range of topics, from friendship to illness, from fear to poverty, on how to acquire and maintain tranquillity, and why we should not be angry with other people. The writings of the early Stoics, of Zeno (335–263 B.C.E.) the founder of the school, of Chrysippus (c.290–207 B.C.E.) the extremely influential third head of the Stoa, and of others, survive only as quoted fragments found in later works. The question arises as to what extent Epictetus preserved the original doctrines of the Stoic school, and to what extent, if any, he branched out with new emphases and innovations of his own. The nineteenth-century Epictetan scholar Adolf Bonhöffer (1998, 3) remarks: '[Epictetus] is completely free of the eclecticism of Seneca and Marcus Aurelius; and, compared with his teacher Musonius Rufus … his work reveals a considerably closer connection to Stoic doctrine and terminology as developed mainly by Chrysippus.' Evidence internal to the Discourses indicates that Epictetus was indeed faithful to the early Stoics. At 1.4.28–31, Epictetus praises Chrysippus in the highest terms, saying of him, 'How great the benefactor who shows the way! … who has discovered, and brought to light, and communicated, the truth to all, not merely of living, but of living well' (trans. Hard). It would be inconsistent, if not wholly ridiculous, to laud Chrysippus in such terms and then proceed to depart oneself from the great man's teaching. At 1.20.15, Epictetus quotes Zeno, and at 2.6.9–10 he quotes Chrysippus, to support his arguments. Aulus Gellius (Attic Nights 19.1.14) says that Epictetus' Discourses 'undoubtedly agree with the writings of Zeno and Chrysippus'. Scholars are agreed that the 'doctrine of the three topics (topoi)' (fields of study) which we find in the Discourses originates with Epictetus (see Bonhöffer 1996, 32; Dobbin 1998, xvii; Hadot 1998, 83; More 1923, 107). Oldfather (1925, xxi, n. 1), in the introduction to his translation of the Discourses, remarks that 'this triple division … is the only notable original element … found in Epictetus, and it is rather a pedagogical device for lucid presentation than an innovation in thought'. Our enthusiasm for this division being wholly original to Epictetus should be tempered with a reading of extracts from Seneca's Moral Letters (75.8–18 and 89.14–15) where we also find a threefold division of ethics which, although not exactly similar to Epictetus' scheme, suggests the possibility that both Seneca and Epictetus drew on work by their predecessors that, alas, has not survived. Suffice it so say, what Epictetus teaches by means of his threefold division is wholly in accord with the principles of the early Stoics, but how he does this is uniquely his own method. The programme of study and exercises that Epictetus' students adhered to was in consequence different from the programme that was taught by his predecessors, but the end result, consisting in the special Stoic outlook on oneself and the world at large and the ability to 'live the philosophic life', was the same. Epictetus, along with all other philosophers of the Hellenistic period, saw moral philosophy as having the practical purpose of guiding people towards leading better lives. The aim was to live well, to secure for oneself eudaimonia ('happiness' or 'a flourishing life'), and the different schools and philosophers of the period offered differing solutions as to how the eudaimôn life was to be won. No less true of us today than it was for the ancients, few people are content with life (let alone wholly content), and what contributes to any contentment that may be enjoyed is almost certainly short-lived and transient. The task for the Stoic teacher commences with the understanding that (probably) everyone is not eudaimôn for much, or even all, of the time; that there is a reason for this being the case and, most importantly, that there are solutions that can remedy this sorry state of affairs. Indeed, Epictetus metaphorically speaks of his school as being a hospital to which students would come seeking treatments for their ills (Discourses 3.23.30). Each of us, in consequence merely of being human and living in society, is well aware of what comprise these ills. In the course of daily life we are beset by frustrations and setbacks of every conceivable type. Our cherished enterprises are hindered and thwarted, we have to deal with hostile and offensive people, and we have to cope with the difficulties and anxieties occasioned by the setbacks and illnesses visited upon our friends and relations. Sometimes we are ill ourselves, and even those who have the good fortune to enjoy sound health have to face the fact of their own mortality. In the midst of all this, only the rare few are blessed with lasting and rewarding relationships, and even these relationships, along with everything that constitutes a human life, are wholly transient. The ills we suffer, says Epictetus, result from mistaken beliefs about what is truly good. We have invested our hope in the wrong things, or at least invested it in the wrong way. Our capacity to flourish and be happy (to attain eudaimonia) is entirely dependent upon our own characters, how we dispose ourselves to ourselves, to others, and to events generally. What qualities our characters come to have is completely up to us. Therefore, how well we flourish is also entirely up to us. The central claim of Stoic ethics is that only the virtues and virtuous activities are good, and that the only evil is vice and actions motivated by vice (see Discourses 2.9.15 and 2.19.13). When someone pursues pleasure or wealth, say, believing these things to be good, the Stoics hold that this person has made a mistake with respect to the nature of the things pursued and the nature of their own being, for the Stoics deny that advantages such as pleasure and health (wealth and status, and so forth) are good, because they do not benefit those who possess them in all circumstances. Virtue, on the other hand, conceived as the capacity to use such advantages wisely, being the only candidate for that which is always beneficial, is held to be the only good thing (see Plato, Euthydemus 278e–281e and Meno 87c–89a). Thus, the Stoics identify the eudaimôn ('happy') life as one that is motivated by virtue. The term we translate as 'virtue' (from the Latin virtus) is aretê, and means 'excellence'. To progress towards excellence as a human being, for Epictetus, means understanding the true nature of one's being and keeping one's prohairesis (moral character) in the right condition. Epictetus uses the term aretê only occasionally, and whereas the early Stoics spoke of striving for excellence as what was proper for a rational creature and required for eudaimonia ('happiness' or well-being), Epictetus speaks of striving to maintain one's prohairesis in proper order (see Discourses 1.4.18 and 1.29.1). Although things such as material comfort, for instance, will be pursued by the Stoic student who seeks eudaimonia, they will do this in a different way from those not living the 'philosophic life' – for Stoics claim that everything apart from virtue (what is good) and vice (what is bad) is indifferent, that is, 'indifferent' with regard to being good or bad. It is how one makes use of indifferent things that establishes how well one is making progress towards aretê (moral excellence) and a eudaimôn ('happy') life. Indifferent things are either 'preferred' or 'dispreferred'. Preferred are health and wealth, friends and family, and pretty much all those things that most people pursue as desirable for leading a flourishing life. Dispreferred are their opposites: sickness and poverty, social exclusion, and pretty much all those things that people seek to avoid as being detrimental for a flourishing life. Thus, the preferred indifferents have value for a Stoic, but not in terms of their being good: they have an instrumental value with respect to their capacities to contribute to a flourishing life as the objects upon which our virtuous actions are directed (see Discourses 1.29.2). The Stoic does not lament their absence, for their presence is not constitutive of eudaimonia. What is good is the virtuous use one makes of such preferred things should they be to hand, but no less good are one's virtuous dispositions in living as well as one may, even when they are lacking. To maintain our prohairesis (moral character) in the proper condition – the successful accomplishment of this being necessary and sufficient for eudaimonia ('happiness') – we must understand what is eph' hêmin ('in our power' or 'up to us'; see Discourses 1.22.9–16). If we do not do this, our prohairesis will remain in a faulty condition, for we will remain convinced that things such as wealth and status are good when they are really indifferent, troubled by frustrations and anxieties, subject to disturbing emotions we do not want and cannot control, all of which make life unpleasant and unrewarding, sometimes overwhelmingly so. This is why Epictetus remarks: 'This is the proper goal, to practise how to remove from one's life sorrows and laments, and cries of "Alas" and "Poor me", and misfortune and disappointment' (Discourses 1.4.23, trans. Dobbin). What is in our power, then, is the 'authority over ourselves' that we have regarding our capacity to judge what is good and what is evil. Outside our power are 'external things', which are 'indifferent' with respect to being good or evil. These indifferents, as we saw in the previous section, number those things that are conventionally deemed to be good and those that are conventionally deemed to be bad. Roughly, they are things that 'just happen', and they are not in our power in the sense that we do not have absolute control to make them occur just as we wish, or to make them have exactly the outcomes that we desire. Thus, for example, sickness is not in our power because it is not wholly up to us whether we get sick, and how often, nor whether we will recover quickly or indeed at all. Now, it makes sense to visit a doctor when we feel ill, but the competence of the doctor is not in our power, and neither is the effectiveness of any treatment that we might be offered. So generally, it makes sense to manage our affairs carefully and responsibly, but the ultimate outcome of any affair is, actually, not in our power. What is in our power is the capacity to adapt ourselves to all that comes about, to judge anything that is 'dispreferred' not as bad, but as indifferent and not strong enough to overwhelm our strength of character. That is, we have power over our own minds. The opinions we hold of things, the intentions we form, what we value and what we are averse to are all wholly up to us. Although we may take precautions, whether our possessions are carried off by a thief is not up us (but the intention to steal, that of course is in the power of the thief), and our reputations, in whatever quarter, must be decided by what other people think of us, and what they do think is up to them. Remaining calm in the face of adversity and controlling our emotions no matter what the provocation (qualities of character that to this day are referred to as 'being stoical'), are accomplished in the full Stoic sense, for Epictetus, by making proper use of impressions. To have an impression is to be aware of something in the world. For example, I may look out of my window and have the impression of an airship floating over the houses in the distance. Whether there is really an airship there, half a mile off, or whether there is just a little helium-filled model tied to my garden gate by a bit of string, is a separate question. 'Making proper use of impressions' concerns how we move from the first thing, being aware of something or other, to the second thing, making a judgement that something or other is the case. The Stoic stands in sharp contrast to the non-Stoic, for when the latter faces some disaster, say (let us imagine that their briefcase has burst open and their papers are scattered by the wind all along the station platform and onto the track), they will judge this a terrible misfortune and have the appropriate emotional response to match. Epictetus would declare that this person has made the wrong use of their impression. Few non-Stoics, ignorant of Epictetus' teaching, would do other than rush around after their papers, descending deeper and deeper into a panic, imagining their boss at work giving them a dressing down for losing the papers, making them work extra hours to make good the loss, and perhaps even dismissing them from their job. The Stoic, by contrast, tests their impression to see what the best interpretation should be: losing the papers is a dispreferred indifferent, to be sure, but having an accident of this sort is bound to happen once in a while, and is nothing to be troubled about. They will quietly gather up the papers they can, and instead of panicking with respect to facing their boss, they will rehearse a little speech about having had an accident and what it means to have lost the papers. If their boss erupts in a temper, well, that is a concern for the boss. Our attaining the eudaimôn ('happy') life requires that we judge things in the right way, for 'what disturbs men's minds is not events but their judgements on events' (Handbook 5, trans. Matheson). The three topoi (fields of study) establish activities in which the prokoptôn (Stoic student) applies their Stoic principles; they are practical exercises or disciplines that when successfully followed are constitutive of the eudaimôn ('happy') life which all rational beings are capable of attaining. Our capacity to employ these disciplines in the course of daily life is eph' hêmin ('in our power' or 'up to us') because they depend on our opinions, judgements, intentions and desires which concern the way we regard things over which our prohairesis (moral character) has complete control. The first discipline concerns what someone striving for excellence as a rational being should truly believe is worthy of desire, which for the Stoics is that which is truly good, virtue and action motivated by virtue. Epictetus remarks: 'When I see a man anxious, I say, What does this man want? If he did not want some thing which is not in his power, how could he be anxious?' (Discourses 2.13.1, trans. Long). Those things that most of us, most of the time, seek after as being desirable, what we consider will make our lives go well, are things that are not in our power, and thus the hope we have for securing these things is placed in the hands of others or in the hands of fate. And when we are thwarted in our efforts to gain what we desire we become frustrated (or depressed or envious or angry, or all of these things). To be afflicted with such 'passions', says Epictetus, is the only real source of misery for human beings. Instead of trying to relieve ourselves of these unpleasant emotions by pressing all the harder to secure what we desire, we should rather place our hope not in 'external' things that are not in our power, but in our own dispositions and moral character. In short, we should limit our desire to virtue and to becoming (to the best of our capacities) examples of 'excellence'. If we do not do this, the inevitable result is that we will continue to desire what we may fail to obtain or lose once we have it, and in consequence suffer the unhappiness of emotional disquiet (or worse). And as is the common experience of all people at some time or other, when we are in the grip of such emotions we run the risk of becoming blind to the best course of action, even when construed in terms of pursuing 'external' things. The Stoic prokoptôn, in contrast, sets their hopes on excellence, recognising that this is where their power over things lies. They will still pursue those 'preferred indifferent external' things that are needed for fulfilling those functions and projects that they deem appropriate for them as individuals, and those they have obligations to meet. But they will not be distressed at setbacks or failure, nor at obstructive people, nor at other difficulties (illness, for instance), for none of these things is entirely up to them, and they engage in their affairs in full consciousness of this fact. It is in maintaining this consciousness of what is truly good (virtue), and awareness that the indifferent things are beyond their power, that makes this a discipline for the Stoic prokoptôn. The second discipline concerns our 'impulses to act and not to act', that is, our motivations, and answers the question as to what we each should do as an individual in our own unique set of circumstances to successfully fulfil the role of a rational, sociable being who is striving for excellence. The outcome of our actions is not wholly in our power, but our inclination to act one way rather than another, to pursue one set of objectives rather than others, this is in our power. The Stoics use the analogy of the archer shooting at a target to explain this notion. The ideal, of course, is to hit the centre of the target, though accomplishing this is not entirely in the archer's power, for she cannot be certain how the wind will deflect the arrow from its path, nor whether her fingers will slip, nor whether (for it is within the bounds of possibility) the bow will break. The excellent archer does all within her power to shoot well, and she recognises that doing her best is the best she can do. The Stoic archer strives to shoot excellently, and will not be disappointed if she shoots well but fails to hit the centre of the target. And so it is in life generally. The non-Stoic views their success in terms of hitting the target, whereas the Stoic views their success in terms of having shot well (see Cicero, On Ends 3.22). Appropriate acts are in general measured by the relations they are concerned with. 'He is your father.' This means that you are called upon to take care of him, give way to him in all things, bear with him if he reviles or strikes you. The actions we undertake, Epictetus says, should be motivated by the specific obligations that we have in virtue of who we are, our natural relations to others, and what roles we have adopted in our dealings with the wider community (see Discourses 2.10.7–13). Put simply, our interest to live well as rational beings obliges us to act virtuously, to be patient, considerate, gentle, just, self-disciplined, even-tempered, dispassionate, unperturbed, and when necessary, courageous. This returns us to the central Stoic notion that the eudaimôn ('happy') life is realised by those who are motivated by virtue. The Discipline of Action points out to the prokoptôn how this should be applied in our practical affairs. We must have these principles ready to hand. Without them we must do nothing. We must set our mind on this object: pursue nothing that is outside us, nothing that is not our own, even as He that is mighty has ordained: pursuing what lies within our will [prohairetika], and all else [i.e., indifferent things] only so far as it is given to us. Further, we must remember who we are, and by what name we are called, and must try to direct our acts [kathêkonta] to fit each situation and its possibilities. The loss here is of course loss of eudaimonia. Failing to 'remember who we are' will result in our failing to pursue those actions appropriate to our individual circumstances and commitments. Epictetus says that this happens because we forget what 'name' we have (son, brother, councillor, etc. ), 'for each of these names, if rightly considered, always points to the acts appropriate to it' (Discourses 2.10.11, trans. Hard). To progress in the Discipline of Action, then, the prokoptôn must be conscious, moment by moment, of (a) which particular social role they are playing, and (b) which actions are required or appropriate for fulfilling that role to the highest standard. This exercise focuses on 'assenting to impressions', and continues the discussion already introduced in the section above on making proper use of impressions. 'Assent' translates the Greek sunkatathesis, which means 'approve', 'agree', or 'go along with'. Thus, when we assent to an impression (phantasia) we are committing ourselves to it as a correct representation of how things are, and are saying, 'Yes, this is how it is.' The Discipline of Assent, then, is an exercise applied to our impressions in which we interpret and judge them in order to move from having the impression of something or other, to a declaration that such-and-such is the case. And we should do this with a view to avoiding falling prey to subjective (and false) evaluations so that we can be free from deception and from making rash judgements about how to proceed in the first two disciplines. For if we make faulty evaluations we will end up (with respect to the first discipline) having desires for the wrong things (namely, 'indifferents'), and (with respect to the second discipline) acting inappropriately with regard to our duties and obligations. This is why Epictetus remarks that the third topic 'concerns the security of the other two' (Discourses 3.2.5, trans. Long). What we must avoid, then, is adding to our impressions immediately and without proper evaluation any notion that something good or bad is at hand. For the only thing that is good is moral virtue, and the only harm that anyone can come to is to engage in affairs motivated by vice. Thus, to see the loss of a ship as a catastrophe would count as assenting to the wrong impression, for the impression that we have is that of just a ship being lost. To take the extra step of declaring that this is a misfortune and harmful would be to assent to an impression that is not in fact present, and would be a mistake. The loss of a ship, for a Stoic, is nothing more than a dispreferred indifferent, and does not constitute a harm. For Epictetus, the terms 'God', 'the gods', and 'Zeus' are used interchangeably, and they appear frequently in the Discourses. In the Handbook, God is discussed as the 'captain' who calls us back on board ship, the subsequent voyage being a metaphor for our departure from life (see Handbook 7). God is also portrayed as 'the Giver' to whom we should return all those things we have enjoyed on loan when we lose close relatives or friends who die, and when we lose our possessions through misfortune (see Discourses 4.10.16 and Handbook 11). Because I'm bad, I'll follow anyway. Epictetus presents orthodox Stoic views on God. His justification for believing in God is expressed essentially along the lines of what we recognise as an argument from design. The order and harmony that we can perceive in the natural world (from astronomical events to the way plants grow and fruit in season) is attributed to a divine providence that orders and controls the entire cosmos intelligently and rationally (see Discourses 1.6.1–11, 1.14.1–6, 1.16.7–8 and 2.14.11/25–7). The Stoics were materialists, and God is conceived of as a type of fiery breath that blends perfectly with all other matter in the universe. In doing this, God transforms matter from undifferentiated 'stuff' into the varied forms that we see around us. This process is continuous, and God makes the world as it is, doing what it does, moment by moment. Just as the soul of a person is understood to bring alive and animate what would otherwise be dead and inert matter, so God is thought of as the 'soul of the world', and the universe is thought of as a sort of animal. The capacity that the prokoptôn has for understanding, accepting, and embracing this state of affairs, that this is indeed the nature of things, is another of the main foundation stones of Stoic ethics. The outlook adopted and the activities performed by the Stoic student in pursuit of excellence, as detailed in the sections above, are frequently referred to collectively by Epictetus (following the Stoic tradition) as 'following nature' or 'living in harmony with nature'. The Stoic prokoptôn maintains his 'harmony with nature' by being aware of why he acts as he does in terms of both (a) what his appropriate actions are, and (b) accepting what fate brings. If, for example, the prokoptôn is berated unfairly by his brother, he will not respond with angry indignation, for this would be 'contrary to nature', for nature has determined how brothers should rightly act towards each other (see Discourses 3.10.19–20). The task the Stoic student shoulders is to pursue actions appropriate to him as a brother, despite all and any provocation to act otherwise (see Handbook 30). This, for Epictetus, is a major component of what it means to keep one's prohairesis (moral character) in harmony with nature (see Discourses 1.6.15, 3.1.25 and 3.16.15). Keeping ourselves in harmony with nature requires that we focus on two things. Firstly, we must pay attention to our own actions so that we respond appropriately, and secondly we must pay attention to the world in which our actions take effect and which prompts those actions in the first place. In this extract about going to the baths, Epictetus focuses more on accepting what fate brings, saying that we should anticipate the sorts of things that can happen, so that when they do we will not be surprised and will not be angry. In other situations, anticipation of trouble or misfortune is impossible, but all the same, the Stoic will accept their fate as what God has ordained for them, and this for Epictetus is the very essence of keeping in harmony with nature (see Discourses 1.4.18–21). Every problem we face in life should be understood as a new opportunity to strengthen our moral character, just as every new bout for the wrestler provides an opportunity for them to train their skill in wrestling. To be instructed is this, to learn to wish that every thing may happen as it does. And how do things happen? As the disposer [i.e., God] has disposed them. And he has appointed summer and winter, and abundance and scarcity, and virtue and vice, and all such opposites for the harmony of the whole; and to each of us he has given a body, and parts of the body, and possessions, and companions. In this last extract we see Epictetus refer to the ideal Stoic practice as that of 'following the gods'. This means essentially the same as 'following nature', for God, who is immanent in the world (as the Stoics understand it) is identified with the way the world manifests, so if one follows nature, one must also be following God (see Discourses 1.20.15, 1.30.4, 4.7.20 and 4.10.14). Epictetus employs a number of metaphors to illustrate what the Stoic attitude to life should be.
. At Discourses 2.5.2, in encouraging his students to appreciate that external things are indifferent (being neither good nor bad), Epictetus says that we should imitate those who play dice, for neither the dice nor the counters have any real value; what matters, and what is either good or bad, is the way we play the game. Similarly at 2.5.15–20, where Epictetus discusses the example of playing a ball game, no one considers for a moment whether the ball itself is good or bad, but only whether they can throw and catch it with the appropriate skill. What matters are the faculties of dexterity, speed and good judgement exhibited by the players, for it is in deploying these faculties effectively that any player is deemed to have played well. (See also Discourses 4.7.5/19/30–1.) Epictetus also uses the metaphor of playing games when discussing suicide, for just as someone stops playing a game when they are no longer amused by it, so it should be in life generally: if life should become unbearable, no one can force us to keep living it.
. In this metaphor, the wool that the weaver uses to make cloth takes the place of the ball in the game; that is, whatever material comes our way, it is our duty to make proper use of it, and if possible make it into the best thing of its kind as we can (see Discourses 2.5.21–2).
. We have already seen, when discussing the Discipline of Action, that Epictetus urges us to 'remember who we are' and what 'name' we have, because what role we play in life will determine which actions are appropriate for us. Obviously, the metaphor of life as a play expands on this idea, but also brings in the notion of our having to accept our fate, whatever that may be, since we do not ourselves chose the role we must play (for although we may aim for one role rather than another, we must recognise that our attaining it is not, in fact, 'in our power').
. This metaphor returns us to the Stoic idea that the universe is governed by God, and that, like it or not, we are all in service to God. The Stoic prokoptôn (student making progress) should understand that they should live life attempting to discharge this service to the highest standards. Epictetus addresses the person who is upset that they are obliged to travel abroad, causing their mother to be distressed at their absence. Do you not know that life is a soldier's service? One man must keep guard, another go out to reconnoitre, another take the field. It is not possible for all to stay where they are, nor is it better so. But you neglect to fulfil the orders of the general and complain, when some severe order is laid upon you; you do not understand to what a pitiful state you are bringing the army so far as in you lies; you do not see that if all follow your example there will be no one to dig a trench, or raise a palisade, no one to keep night watch or fight in the field, but every one will seem an unserviceable soldier. In making progress, the Stoic prokoptôn will pay a price. In standing to God, the world, society, herself and her undertakings in this new way (by accepting the Stoic notions of what is truly good, what is truly up to her, where her proper duties lie, and in considering her life to be one of service to God), the prokoptôn separates herself from the rest of society in fairly marked, if not profound, ways. For example, Epictetus wants his students to enjoy and participate in the 'festival of life', yet at the public games (for instance) they must not support any one individual, but must wish the winner to be he who actually wins; they must refrain entirely from shouting or laughing, and must not get carried away by the spectacle of the contest (Handbook 33.10). So whilst the prokoptôn's friends immerse themselves fully in the games, cheering on their man and jeering at his opponent, the Stoic stands aloof and detached. Deliberately separating herself from the crowd is the price she pays for well-being (eudaimonia), dispassion (apatheia), tranquillity and imperturbability (ataraxia), along with the conviction that she is living as God intends. But having declared her hand, the prokoptôn will pay in other ways also, for those around her will rebuke and ridicule her (Handbook 22), for in abandoning the values and practices common to the wider community, she will provoke hostility and suspicion. Yet there remains the hope that some at least will see the prokoptôn as someone whose wisdom has value for the community at large, as someone who serves as an example of how one may get along in the world without being overwhelmed by it, as someone with specific skills to offer, such as mediating family disputes and suchlike (see Discourses 1.15.5). This is the position and character of a layman: He never looks for either help or harm from himself, but only from externals. This is the position and character of the philosopher: He looks for all his help or harm from himself. 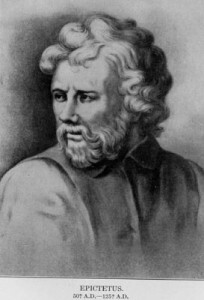 For having attained such enlightenment himself (for surely this we must suppose), Epictetus devoted his life to raising up others from the crowd of humanity who could stand beside him and share in a perception of the universe and a way of life that any rational being is obliged to adopt in virtue of the nature of things. adiaphora 'indifferent'; any of those things that are neither good or bad, everything, in fact, that does not fall under the headings 'virtue' or 'vice'. The indifferents are what those lacking Stoic wisdom frequently take to have value (either positive or negative), and hence take to be desirable or undesirable. Pursuing them, or trying to avoid them, can lead to disturbing emotions that undermine one's capacity to lead a eudaimôn life. freedom from passion, a constituent of the eudaimôn life. aversion; the opposite of hormê. any 'dispreferred' indifferent, including such things as sickness, poverty, social exclusion, and so forth (conventionally 'bad' things). Suffering any of the dispreferred indifferents does not detract from the eudaimôn life enjoyed by the Stoic sophos. See proêgmena. 'excellence' or virtue; in the context of Stoic ethics the possession of 'moral excellence' will secure eudaimonia. For Epictetus, one acquires this by learning the correct use of impressions, following God, and following nature. training or exercise undertaken by the Stoic prokoptôn striving to become a Stoic sophos. see sunkatathesis and phantasiai (impressions). imperturbability, literally 'without trouble', sometimes translated as 'tranquillity'; a state of mind that is a constituent of the eudaimôn life. 'external'; any of those things that fall outside the preserve of one's prohairesis, including health, wealth, sickness, life, death, pain – what Epictetus calls aprohaireta, which are not in our power, the 'indifferent' things. what is in our power, or 'up to us' – namely, the correct use of impressions. 'happiness' or 'flourishing' or 'living well'. One achieves this end by learning the correct use of impressions following God, and following nature. 'good feelings', possessed by the Stoic wise person (sophos) who experiences these special sorts of emotions, but does not experience irrational and disturbing passions. 'commanding faculty' of the soul (psuchê); the centre of consciousness, the seat of all mental states, thought by the Stoics (and other ancients) to be located in the heart. It manifests four mental powers: the capacity to receive impressions, to assent to them, form intentions to act in response to them, and to do these things rationally. The Discourses talk of keeping the prohairesis in the right condition, and also of keeping the hêgemonikon in the right condition, and for Epictetus these notions are essentially interchangeable. impulse to act; that which motivates an action. any 'appropriate action', 'proper function', or 'duty' undertaken by someone aiming to do what befits them as a responsible, sociable person. The appropriate actions are the subject of the second of the three topoi. a 'right action' or 'perfect action' undertaken by the Stoic sophos, constituted by an appropriate action performed virtuously. 'desire' properly directed only at virtue. any of the disturbing emotions or 'passions' experienced by those who lack Stoic wisdom and believe that externals really are good or bad, when in fact they are 'indifferent'. A pathos according to the Stoics is a false judgement based on a misunderstanding of what is truly good and bad. 'impressions', what we are aware of in virtue of having experiences. Whereas non-rational animals respond to their impressions automatically (thus 'using' them), over and above using our impressions, human beings, being rational, can 'attend to their use' and, with practice, assent or not assent to them as we deem appropriate. The capacity to do this is what Epictetus strives to teach his students. nature. To acquire eudaimonia one must 'follow nature', which means accepting our own fate and the fate of the world, as well as understanding what it means to be a rational being and strive for virtue. See aretê and God. any 'preferred' indifferent, conventionally taken to be good, including such things as health and wealth, taking pleasure in the company of others, and so forth. Enjoying any of the preferred indifferents is not in itself constitutive of the eudaimôn life sought by the Stoic prokoptôn. See apoproêgmena. 'moral character', the capacity that rational beings have for making choices and intending the outcomes of their actions, sometimes translated as will, volition, intention, choice, moral choice, moral purpose. This faculty is understood by Stoics to be essentially rational. It is the faculty we use to 'attend to impressions' and to give (or withhold) assent to impressions. one who is making progress (prokopê) in living as a Stoic, which for Epictetus means above all learning the correct use of impressions. the Stoic wise person who values only aretê and enjoys a eudaimôn life. The sophos enjoys a way of engaging in life that the prokoptôn strives to emulate and attain. assent; a capacity of the prohairesis to judge the significance of impressions. disturbance, trouble; what one avoids when one enjoys ataraxia. end; that which we should pursue for its own sake and not for the sake of any other thing. For the Stoic, this is virtue. Epictetus formulates the end in several different but closely related ways. He says that the end is to maintain one's prohairesis in proper order, to follow God, and to follow nature, all of which count as maintaining a eudaimôn life. The means by which this is to be accomplished is to apply oneself to the 'three disciplines' assiduously. God, who is material, is a sort of fiery breath that blends with undifferentiated matter to create the forms that we find in the world around us. He is supremely rational, and despite our feelings to the contrary, makes the best world that it is possible to make. Epictetus says that we should 'follow God', that is, accept the fate that He bestows on us and on the world. Stoics understand that the rationality enjoyed by every human being (and any other rational beings, should there be any) is literally a fragment of God. 'topics'. The 'three topics' or 'fields of study' which we find elucidated in the Discourses is an original feature of Epictetus' educational programme. The three fields of study are: (1) The Discipline of Desire, concerned with desire and avoidance (orexis and ekklisis), and what is really good and desirable (virtue, using impressions properly, following God, and following nature); (2) The Discipline of Action, concerned with impulse and aversion (hormê and aphormê), and our 'appropriate actions' or 'duties' with respect to living in our communities in ways that befit a rational being; and (3) The Discipline of Assent, concerned with how we should judge our impressions so as not to be carried away by them into anxiety or disturbing emotions with the likelihood of failing in the first two Disciplines. from the Latin virtus which translates the Greek aretê, 'excellence'. the name for God; Epictetus uses the terms 'Zeus', 'God', and 'the gods' interchangeably. *Boter, Gerard. 1999. The Encheiridion of Epictetus & its Three Christian Adaptations: Transmission & Critical Editions. Leiden: Brill. *Dobbin, Robert. 1998. Epictetus: Discourses Book 1. Oxford: Clarendon. *Hard, Robin. 1995. The Discourses of Epictetus. ed. with introduction and notes by Christopher Gill. London: Everyman/Dent. Includes the complete Discourses, The Handbook, and Fragments. Higginson, Thomas Wentworth. 1890. The Works of Epictetus Consisting of His Discourses, in Four Books, The Enchiridion, and Fragments. Boston: Little, Brown, & Company. Higginson, Thomas Wentworth. 1944. Epictetus: Discourses and Enchiridion. Roslyn, NY: Walter J. Black. Reprint of the nineteenth-century translation with minor editorial alterations. *Higginson, Thomas Wentworth. 1948. The Enchiridion. Upper Saddle River, NJ: Prentice Hall. *Lobell, Sharon. 1995. Epictetus: The Art of Living. The Classic Manual on Virtue, Happiness, and Effectiveness: A New Interpretation. San Francisco: HarperSanFrancisco. A free paraphrase of the Handbook. Long, George. 1890. The Discourses of Epictetus with the Encheiridion and Fragments. London: George Bell. *Long, George. 1991. Enchiridion. Amherst, NY: Prometheus. Matheson, P. E. 1916. Epictetus: The Discourses and Manual. 2 vols. Oxford: Clarendon Press. *Matson, Wallace I. 1998. Epictetus: Encheiridion. in Louis P. Pojman. ed. Classics of Philosophy: Volume 1, Ancient and Medieval. New York: Oxford University Press. *Oldfather, W. A. 1925, 1928. Epictetus: The Discourses as Reported by Arrian, The Manual, and Fragments. 2 vols. Cambridge, MA: Loeb Classical Library, Harvard University Press. With original Greek text facing English translation. *Saunders, Jason L. ed. 1996. Greek and Roman Philosophy after Aristotle. New York: Free Press. Readings from Epicureanism, Stoicism, Scepticism, Philo, Plotinus, and early Christian thought. Includes P. E. Matheson's translation of the Manual of Epictetus. *White, Nicholas. 1983. Handbook of Epictetus. Indianapolis: Hackett. A very competent and readable translation, with notes and a helpful, clear introduction. Inwood, Brad and L. P. Gerson. 1997. Hellenistic Philosophy: Introductory Readings. 2nd edition. Indianapolis: Hackett. Readings from the main schools: Epicureanism, Stoicism and Scepticism. Readings from the main schools: Epicureanism, Stoicism, Scepticism, and the Academics. Includes commentaries on the readings. This is the standard primary source text. Volume 2 contains the original Greek and Latin. Bonhöffer, Adolf Friedrich. 1996. The Ethics of the Stoic Epictetus. trans. William O. Stephens. New York: Peter Lang. A very nicely done translation of this significant nineteenth-century work first published in 1894. Hijmans, B. L. 1959. Askesis: Notes on Epictetus' Educational System. Assen: Van Gorcum. Long, A. A. 2002. Epictetus: A Stoic and Socratic Guide to Life. Oxford: Oxford University Press. Stephens, William O. 1996. Epictetus on How the Stoic Sage Loves. Oxford Studies in Ancient Philosophy 14: 193–210. A very clear, scholarly survey of Epictetus' ethics. Stockdale, James Bond. 1993. Courage Under Fire: Testing Epictetus's Doctrines in a Laboratory of Human Behavior. Stanford: Hoover Institution/Stanford University. An account of how the author used the principles of Stoic ethics to survive the rigors of a Vietnamese prisoner of war camp. Xenakis, Jason. 1969. Epictetus: Philosopher–Therapist. The Hague: Martinus Nijhoff. Annas, Julia. 1995. The Morality of Happiness. New York: Oxford University Press. Gould, Josiah B. 1970. The Philosophy of Chrysippus. Albany, NY: State University of New York Press. Hadot, Pierre. 1995. Philosophy as a Way of Life. Oxford: Blackwell. Engaging essays on the notion of philosophy as a way of life, with focus on Stoic practice. Hadot, Pierre. 1998. The Inner Citadel: The Mediations of Marcus Aurelius. Cambridge, MA: Harvard University Press. Contains a very helpful chapter on Epictetus. Inwood, Brad. 1985. Ethics and Human Action in Early Stoicism. Oxford: Clarendon Press. Lesses, Glen. 1989. Virtue and the Goods of Fortune in Stoic Moral Theory. Oxford Studies in Ancient Philosophy 7: 95–127. Lesses, Glen. 1993. Austere Friends: The Stoics and Friendship. Apeiron 26: 57–75. More, Paul Elmer. 1923. Hellenistic Philosophies. Princeton, NJ: Princeton University Press. Nussbaum, Martha C. 1994. The Therapy of Desire: Theory and Practice in Hellenistic Ethics. Princeton, NJ: Princeton University Press. Contains very helpful chapters on Stoic ethics from the view point of philosophy as therapy, as the ancients conceived it. Reale, Giovanni. 1990. A History of Ancient Philosophy: 4. The Schools of the Imperial Age. ed. & trans. John R. Catan. Albany, NY: State University of New York Press. Sandbach, F. H. 1989. The Stoics. London: Duckworth and Indianapolis: Hackett. Sharples, R. W. 1996. Stoics, Epicureans, and Sceptics: An Introduction to Hellenistic Philosophy. London: Routledge. Striker, Gisela. 1991. Following Nature: A Study in Stoic Ethics. Oxford Studies in Ancient Philosophy 9: 1–73. also in Striker 1996. Striker, Gisela. 1996. Essays on Hellenistic Epistemology and Ethics. Cambridge: Cambridge University Press. Algra, Keimpe, et al. eds. 1999. The Cambridge History of Hellenistic Philosophy. Cambridge: Cambridge University Press. Annas, Julia. 1992. Hellenistic Philosophy of Mind. Berkeley and Los Angeles: University of California Press.